Citronella is a grass that mainly grows in some Asian countries and some islands of the South Pacific. It has a rich, crisp lemony aroma and thus bears the name citronella. The essential oil of citronella is extracted from two varieties of citronella. The first one is the Ceylon variety, whose scientific name is Cymbopogon nardus and the second one is Java variety, called Cymbopogon winterianus in botanical terminology. In both cases, the essential oil is extracted by steam distillation of the fresh plant. While the first variety yields an oil whose main components are citronellol, citronellal, geraniol, limonene and methyl isoeugenol, the oil obtained from the second variety contains citronellal, geraniol, geranyl acetate and limonene as its chief constituents, with geraniol and citronellal higher in concentrations than the former variety. Hence, the oil obtained from the Java variety is considered to be higher quality. The main producers of this essential oil are China and Indonesia. This oil is also produced by certain other Asian, South & Latin American and African countries in smaller amounts. Apart from being used as a flavoring agent for foods & beverages, it has varied medicinal uses, which are listed below. Components like methyl isoeugenol and a few others that are found in this essential oil are responsible for this property. They kill bacteria and inhibit any further bacterial growth in the body. This is particularly helpful in treating infections in wounds, as well as in the colon, urethra, urinary bladder, stomach, intestines, urinary tracts, prostate, and kidneys. This oil fights depression and gives relief from anxiety, sadness, and negative feelings. It induces a fresh, happy feeling and hope. The antiseptic properties of this essential oil fight infections in wounds, as well as the urinary tracts, urethra, prostate, and kidneys, while simultaneously protecting them from being sepsis. It relieves spasms of the muscles, respiratory system, and nervous system. It also helps to cure menstrual spasms and gives relief from symptoms such as cramps and coughs. Citronella essential oil sedates inflammation, particularly those situations which pertain to the liver, stomach, intestines and other parts of the digestive system. The inflammations caused as side effects of drugs, excessive use of alcohol or narcotics, hard & spicy food, any disease, or any toxic element getting into the body can also be alleviated using this oil. The crisp, rich citrus or lemon-like aroma of this oil drives away body odor and is used in deodorants and body sprays, although in very small quantities, since in heavy doses it may create skin irritations. It can also be mixed with the bath water to have a refreshing bath. The diaphoretic properties of this essential oil increase sweating and promote the removal of toxins and other unwanted materials like excess water, fat, and salts from the body. This makes the body feel lighter, keeps the skin healthy and also reduces fever. This also protects you from certain infections. 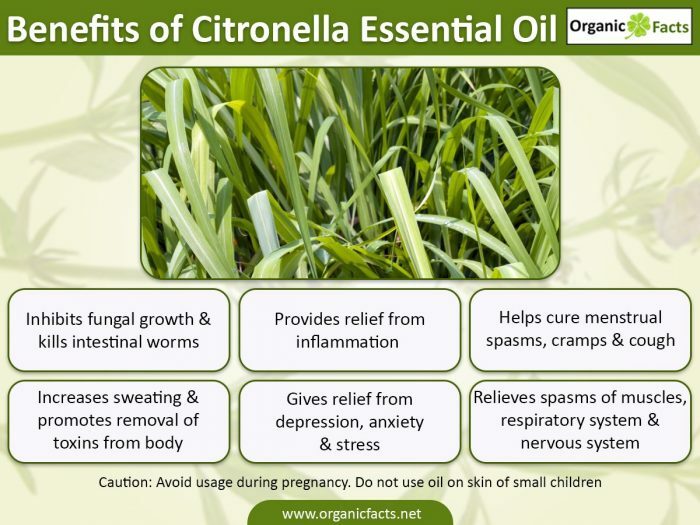 The increase in the frequency and quantity of urination due to this property of citronella essential oil has many benefits. It disposes of waste substances and toxins from the body, including uric acid, excess bile, acids, and salts, as well as water and fats. This helps reduce weight, eliminate infections in the urinary system, free the body from toxins, reduce chances of renal calculi, rheumatism, and arthritis, improve digestion, and keep the heart healthy. While the diaphoretic property of this oil increases perspiration, its anti-inflammatory property reduces inflammation, while the antimicrobial property fights infections. The combined effects of these three properties fight fever and reduce body temperature. This oil kills fungus and inhibits fungal growth. This is very useful in countering fungal infections in the ear, nose and throat region. Contracting fungal infections in the ears are very common and can be very serious. It eliminates fungal infections in other parts of the body as well and helps cure fungal dysentery. This is one of the most commonly used properties of this essential oil, as it kills and keeps away insects. It has been found particularly effective on a species of mosquito, called Aedes aegypti whose bite causes the dreaded yellow fever. This is also effective on lice, body and head louse, and fleas. The use of this oil clears the stomach from infections and other problems and helps it function properly. The stimulating effect of the essential oil of citronella stimulates blood circulation, secretions and discharges like hormones and enzymes from the glands, brain while also increasing activity in the nervous system. This essential oil also stimulates the immune mechanisms and the metabolism of the body. This property means that citronella essential oil has an overall toning effect on the body. It tones up digestion, excretion, the nervous system, and the brain while fortifying the body. Citronella essential oil kills intestinal worms. It should be administered in mild doses to children since children are most prone to worms. It is effective on both roundworms and tapeworms. Since the presence of worms interferes with the normal physical and mental growth and also with the absorption of nutrients by the body, the use of this oil can greatly increase your quality of life by eliminating those dangerous parasites. Furthermore, this oil can be used in the treatment of problems like oily skin, oily hair, abnormal palpitations, colitis, migraine, neuralgia, fatigue, headache, nausea, and abdominal pain resulting from gas or cramps.